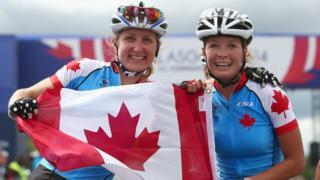 Canada's Catharine Pendrel and Emily Batty take gold and silver respectively in the women's cross-country as mountain biking returns to the Commonwealth Games for the first time in eight years. Australia's Rebecca Henderson fought a close battle with Batty throughout the race, but was dropped by the Canadian during the last lap and finished third. Annie Last, in fourth, and fellow English rider Alice Barnes, in fifth, finished more than three minutes behind Pendrel.